In the very moment before Sky News started their interview with me I snatched off my hat. "It was an odd thing for me to do", I mused to Mrs Botogol later that evening, over a glass of red wine. "Well, not that odd", she said "when you consider the hat." "Will I be on the telly? ", I had asked the reporter when she approached me "Not necessarily", she said, "We're chatting to a few of you in the queue; it depends what you say, really". She asked me why I had been prepared to stand in the cold three hours waiting to watch Alastair Campbell. "Oh, yes", she said, "you'll definitely be on the telly"
Unfashionably enough: I do like Alastair Campbell. He's a person whom it's acceptable for the public to hate (he has that in common with Mrs Thatcher) but he's also a man who shows great resilience and purpose, and who commands a tremendous personal loyalty from friends and colleagues: intriguing and valuable qualities, and not to be underestimated. I have a lot of time for him, and I certainly don't blame him for sticking up for himself and his boss yesterday. I will admit that I overestimated his public appeal though: with only sixty seats available to the punters at 9am I judged it necessary to be there at 6:30, at which time I was comfortably the first in the queue. By 7am there were two of us, and a sympathetic receptionist took pity and let us into the warm foyer. By 8am there were still only seven when we were thrown back out on to the street by an unsympathetic security guard and told to form a proper queue, already, why don't we? And who let us inside anyway?" For while the Iraq Public Inquiry makes the public welcome, but it doesn't like to let them get too comfortable. 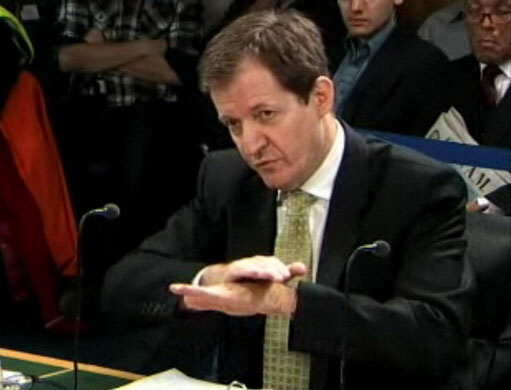 The tiny Hearing Room was crazily organised such so that the person we had actually come to see was the least visible: In fact Alastair Campbell was practically invisible, seated with his back to the audience, his face displayed on a corner TV monitor, on which video and audio were unsynchronised. Note to organisers: change the layout of the room so that the panel and witness sit sideways across the front, so that the public can see them all. Campbell actually looked nervous when he entered the room, grasping a large blue folder of notes and reminders, and he focused hard on the opening questions, but as the panel wasted no less than an hour to establish merely that he was one of Blair's inner circle and, yes, he had access to everything, Campbell relaxed and grew more ebullient, combative and sure of himself even correcting chronological mis-statements from the panel. The questioners had a go at probing but Campbell reckoned he was better at this game than they were; and clearly he was right: they wasted so much of the morning session on protocols and procedures that Campbell ended up mentioning the dossier before they did. The cached thought you'll read in the press is the panel needs a lawyer, but when Campbell made his "I don't read the headlines" claim it was a snorting Jeremy Paxman who might have made a real difference. But if Campbell didn't think much of the panel, neither did the panel think much of his evidence "I think we're coming from a different direction from that", observed Lawrence Freedman at one point drily, and portentously. Just as Campbell had prepared his answers in advance of the questions so, I suspect, have the Inquiry worded their report in advance of his evidence. "No... I am afraid not", said the staff member, evenly... but not quite smoothly: a tiny hesititation giving away a flicker of conscience. "In that case", I said, "can you tell me on which floor is the Technology Conference"
"It's Third floor", he said mechanically…but why.. oops"... and I ran for the lifts and made it to the mingle room where I had three cups of coffee and eleven biscuits"
I bet the Panel get a cup of coffee in the breaks. And the witness. And the press. Just not the public. About 10 years ago I worked on a dossier. I was a consultant and it was a proposal for large bank, we had to prepare a detailed statement of qualification. We had two weeks to write it and on the seventh day, just 48hrs before the deadline, two previously unseen senior partners arrived in the war room (yes, blush, we called it the war room) to take charge of the 'presentation' of the document, and they rewrote it all. The thing is: they did make it better. A fresh eye, especially an experienced and wise one, does add value and although we cursed as we cut and amplified, and toned down and sexed up, we were also caught up by the transformation of the stodgy inventory we had prepared into the selling document it became. At just one point did I object to a claim I thought particularly egregious and the partner put down his red pen and he asked me "Alibert, of course there can be nothing factually incorrect here. If you are telling me it's wrong, well then I'll change it.. Is it actually wrong?" I was only a Junior Consultant, and still it stings to tell the tale; but you couldn't bully a head of the Joint Intelligence Committee like that, could you? - "I said it was wrong, but they wouldn't let me change it" feebler still. - but "I agreed with dossier" ..well, that's not so bad, is it. Choose one from three. I know where my money is. "I was told that the foreword was a political statement and that I had no business altering or commenting on the tone or feel of it, my role was purely to advise if there were factual errors." IMHO the most telling part of Campbell's evidence was where he admitted that the intelligence that "battlefield munitions" could be employed in around 20-40 minutes transmuted into, in the foreword, a statement that "weapons could be deployed within 45 minutes". Whilst this does not render the statement untrue, it does make it misleading. Campbell's only "defence" to this charge was to argue that if he was in the business of "sexing up" the document he would have used the 20 minutes time frame and not 45 minutes was disingenuous. 20 or 45 minutes makes no difference. "Battlefield munitions" vs [long range nuclear delivery] "weapons" does. All the difference in the world. Yet the changed sentence is not a lie, just a misleadingly broad statement. As it is not factually incorrect, it is quite plausible that Scarlett would not have felt that he had the locus standi to alter what was, after all, to be a personal political statement by the PM. One very important point: As a new friend, I’m delighted and comforted to learn of your skill and ability in finding food and drink! Hats off to the Awesome ‘Hunters-Gatherers 101’ How many can do what you did? :-) Not many!